What are the sustainability risks and opportunities? And how can we make a difference? Transformative Transparency is a new kind of traceability platform. It harnesses huge untapped data sets to see inside complex commodity supply chains, helping link production landscapes – and the social and environmental impacts and opportunities associated with them – to specific traders, manufacturers, retailers and investors worldwide. Q. What can Transformative Transparency do? Q. What can I do with the beta version of the platform? Q. Who can benefit from the platform? Q. How is it different from other supply chain initiatives? Q. What data does TTP use and how reliable is it? Q. Who is behind Transformative Transparency? We welcome your comments and suggestions on the platform! Please email us at TTP-Feedback@sei-international.org. A. The Transformative Transparency platform combines detailed data on shipments of commodities between ports and traders, with country-specific data on subnational production, in order to produce detailed mapping of supply chains and the actors involved in them. The mapping is integrated with third-party data on socio-environmental concerns, making it possible to identify hotspots, risks and sustainability opportunities, and to support more sustainable investment, procurement and regulatory decisions. Our vision for Transformative Transparency is to eventually cover the most important agricultural commodities associated with deforestation risk – soy (and beef), coffee and palm oil – and their trade and export to consumers worldwide. With sufficient funding, we believe we can provide reliable data for around 25 countries, representing the vast majority of global production of these commodities. Q. Who can benefit from Transformative Transparency? Retailers, importers and others striving to meet deforestation and other sustainability-related commitments, and derisk their supply chains. TTP can help them monitor progress, demonstrate their sustainability credentials to consumers and business partners, cooperate with other actors along their supply chains, and plan more sustainable sourcing strategies. Producer-country governments who want to promote sustainable production, reduce poverty, and monitor the activities of producers and exporters. Consumers and consumer groups interested in more sustainable consumption. Ethical trade watchdogs and advocacy groups. However, our aim is simply to deliver the world´s most comprehensive, publicly available supply chain transparency platform for internationally traded agricultural commodities. We fully expect different users to discover their own innovative uses for it. Q. How is TTP different from other supply chain initiatives? A. Transformative Transparency charts a middle path between country-level footprint analyses and bespoke, commodity-specific traceability systems, providing both a comprehensive overview of flows of a commodity from producer to consumer country, and sufficiently fine-grained information to link individual supply chains to specific local actors, conditions and risks (e.g. water scarcity, deforestation risk). In doing so, it makes widely available for the first time a more actor-driven , sector-wide and jurisdiction-specific approach to supply chain governance. Cost-efficient – The kinds of data employed by the platform can be used to map trade flows and impacts across entire countries and multiple commodities, decreasing the need for detailed investigations of specific supply chains. Responsive – The platform can be updated quickly, and can be easily expanded to give comprehensive information on a new commodity or producer country when new data becomes available. Comprehensive – Today, interventions and scrutiny to improve sustainability are often disproportionately focused on high-profile producer regions such as the Brazilian Amazon, and on highly visible multinational actors. With its more comprehensive approach, the platform can shed new light on the performance of other “hidden” actors and on the situation in less well-analysed geographies, providing new entry points for action and decreasing the risk of “leakage” of environmental and social problems to new areas. Standardized and comparable – Because the platform uses the same sources and types of data for different areas and commodities, it is possible to make valid comparisons regarding performance and risk across production landscapes and countries, companies and supply chains. Publicly accessible – Enabling the wide access needed to support more sustainable procurement and investment, strengthen the work of governments and watchdog organizations and foster innovation by third-party users. Q. What data does the platform exploit and how reliable is it? A. The supply chain mapping builds on several sources of data. To trace exports back to production localities we have used subnational production data from national governments. The mapping of global trade flows relies chiefly on customs declarations and bills of lading, which should be very reliable since they originate from legal contracts between trading partners. These are supplemented with other data sets from official sources, such as national allocation of goods, commodity processing and storage, and revenues). Modeling has been used to fill the (relatively few) gaps in the data. (The methodology is explained in Godar et al. 2015.) As the platform only covers countries where detailed shipment data exists, we believe that it should be highly reliable. However, we cannot be more accurate than the data we rely on, and quality varies between countries. In the longer run, we hope to invite private companies (traders, shippers) to add their own data to the platform to make the analysis even richer and more useful. However, while we have tried to adhere to the highest levels of quality control, the results from TTP are indicative only, and should always be verified with third party data. A. This beta version of Transformative Transparency is currently accessible to a selected users with a special access code. The beta allows users to explore interactive supply chain maps for Colombian coffee and Brazilian soy. It is possible to follow these commodities from the producer jurisdictions (departments in Colombia, and municipalities in Brazil), via various named intermediary traders and shipping points, to consumer countries. Charts and maps interact to give specific data on flows, including an option to link them directly to deforestation risk in Brazilian municipalities. It is also possible to zoom in on companies in the Forest 500. A. Transformative Transparency is being developed by a consortium convened by Stockholm Environment Institute (SEI) and the Global Canopy Program (GCP). The initial stage of development has been generously funded by the Swedish International Development Cooperation Agency (Sida), via the SEI Initiative on Producer to Consumer Sustainability (P2CS) and the EU REDD Facility at the European Forest Institute. The methodology for linking global consumption and subnational regions of production was supported by the Nordic Council of Ministers through the NORD-STAR project. Supporting partners in initial development work include the International Institute for Sustainability, Gibbs Land Use and Environment Laboratory at Wisconsin University, Conservation International and Transitions. Key research contributions have been made by Patrick Meyfroidt, Louvain University; Martin Persson, Chalmers University; and Jorge Tizado, León University. Q. How can I get involved? A. We are actively seeking to build relationships with new partner institutions and funders to further the development and applications of the platform to include new countries, commodities, capabilities and data. Transformative Transparency is conceived as an open-access platform that is compatible with other initiatives working on the sustainability of agricultural production systems and international trade. Please contact Javier Godar or Toby Gardner if you would like to learn more and get involved. 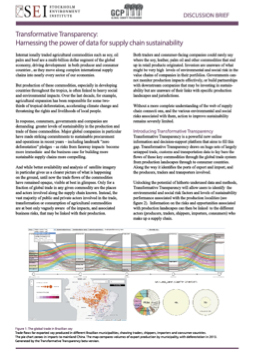 Transformative Transparency is a unique interactive toolkit and information system for understanding and exploring the global supply chains of some of the most important ´forest risk´ agricultural commodities. This is a limited beta version showcasing some of the capabilities we are developing. It is only accessible to selected users during a testing phase. Subject to funding, a next step is to implement a fully functional online version for a larger number of commodities and producer countries, and extend the work of the platform to develop user-tailored decision support capabilities. Our medium-term vision is to build a platform that encompasses the majority of global production and trade for the most important forest risk agricultural commodities. If you would like to receive further updates on the development of the platform please register your interest here. If Transformative Transparency could add value to your work, and you would like to test the platform, discuss the work in more depth, test the platform, or find out how you could get involved please write to Javier Godar or Toby Gardner at SEI or Niki Mardas at GCP.